« What will become of me? Humpty Dumpty is a character in an English nursery rhyme, probably originally a riddle and one of the best known in the English-speaking world. He is typically portrayed as a personified egg, though he is not explicitly described so. The first recorded versions of the rhyme date from late eighteenth-century England and the tune from 1870 in James William Elliott’s National Nursery Rhymes and Nursery Songs. Its origins are obscure and several theories have been advanced to suggest original meanings. 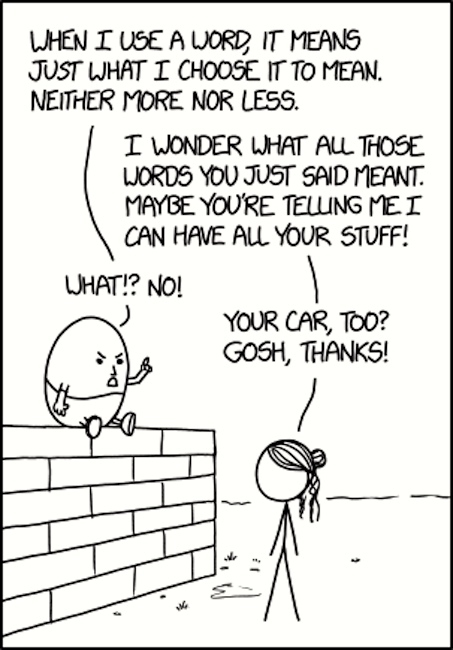 In the comic Humpty is explaining to “Alice” (portrayed by Science Girl) that he can choose meanings for his words. “Alice” wonders what meaning should be given to that utterance, and decides it means “Please take all my belongings”. [If Humpty can stipulate meanings, so can she. Take that, Egg Man!] Humpty realizes he has been caught in a trap, but now Alice is choosing meanings, and even his protests are taken to mean “take my car too”. While it seems that Alice chooses these specific meanings of words to educate Humpty Dumpty about the mistake in his way of thinking, she could as well inform him about planned theft with random, meaningless words or not at all. After all, she got “permission”. Also, even though Humpty Dumpty decides about the meanings of words by himself, he “accidentally” chooses the normal meanings of all of Alice’s words, because otherwise he wouldn’t be informed about the planned theft and wouldn’t be able to react to this with “What!? No!”. … Carroll’s Humpty Dumpty is a parody of people who use technical language without defining their terms, and expect others to understand. The title text continues this. 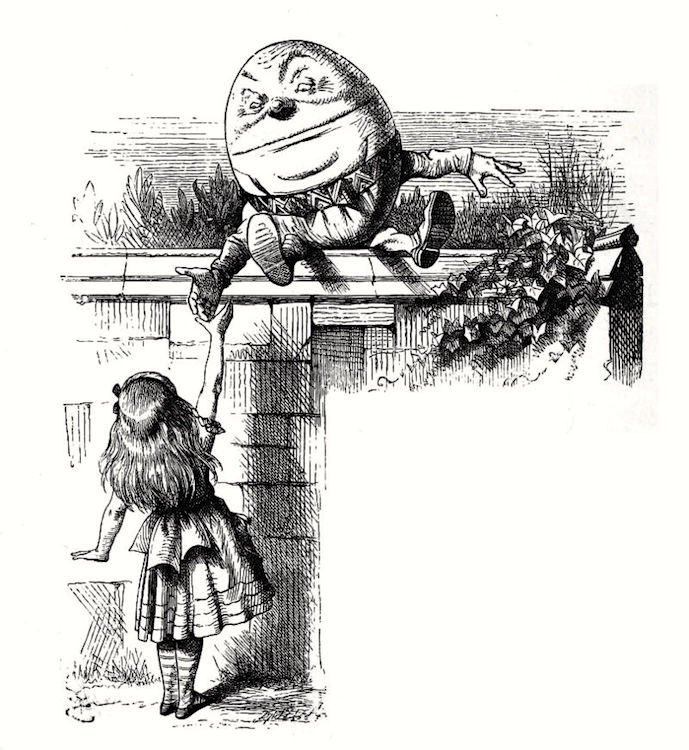 By Humpty insisting that he is not responsible for others understanding him he is unable to get help getting down from the wall, which will lead to his inevitable demise. Humpty’s error here could then be seen, not as a failure to define technical terms, but as inappropriately behaving, in an everyday conversational context, like a mathematician (which Lewis Carroll was) in technical discourse, where a speaker or writer is free to stipulate words and their meanings. In mathematics, a group is an algebraic structure consisting of a set of elements equipped with an operation that combines any two elements to form a third element. The operation satisfies four conditions called the group axioms, namely closure, associativity, identity and invertibility. Closure: For all a, b in G, the result of the operation, a • b, is also in G.
Associativity: For all a, b and c in G, (a • b) • c = a • (b • c). Identity element: There exists an element e in G such that, for every element a in G, the equation e • a = a • e = a holds. Such an element is unique, and thus one speaks of the identity element. Inverse element: For each a in G, there exists an element b in G, commonly denoted a−1 (or −a, if the operation is denoted “+”), such that a • b = b • a = e, where e is the identity element. In this case, in this context, when I use the word group, it means just what I choose it to mean — neither more nor less. This entry was posted on July 8, 2017 at 11:42 am and is filed under Books, Lexical semantics, Linguistics in the comics, Philosophy, Semantics, Technical and ordinary language. You can follow any responses to this entry through the RSS 2.0 feed. You can leave a response, or trackback from your own site.